Here are some pictures comparing the state of my hair the first time I went (click here for the first blog post) and the second time I went. 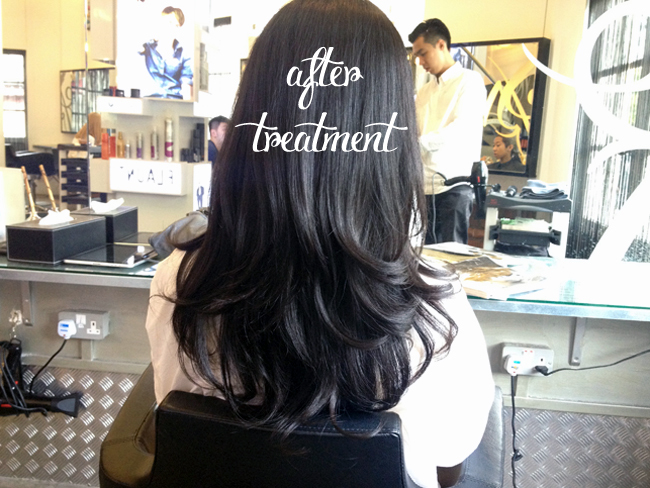 They are both 'Before' photos, and you can trust them because I really do NOT do anything to my hair. It kills people to know that I am so meticulous with my face but flat lazy with my hair. *shrugs* haha. As you can see, the hair in the first photo is ultimately revolting - dry and staticky and just all over the place. The second one is more in place, smoother, and softer. Naturally, it is also because I had not had a haircut in 2 years in the previous photo, so that's about as damaged as my hair can get. This, is the result of my second treatment! (ps - can you spot my boyfriend in the background?? haha) My hair is soft and flowy, and extremely well behaved for the rest of the day! 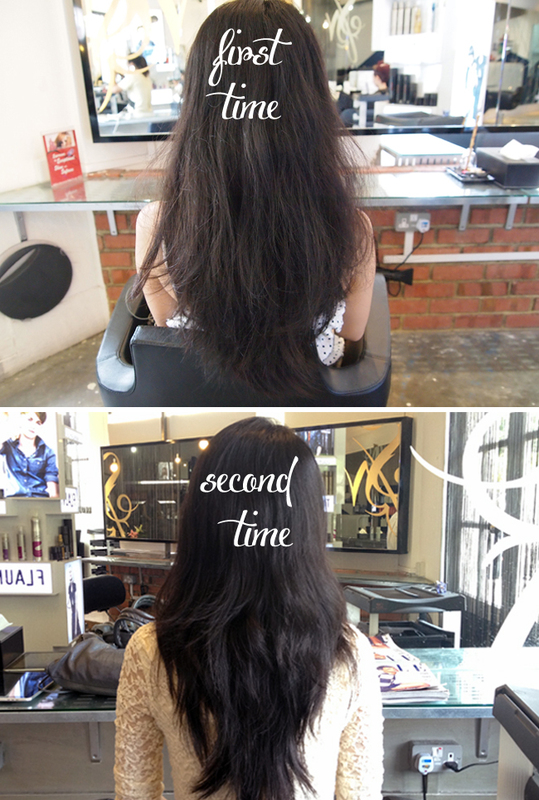 Though, to be honest to ourselves, just how often do we have the time or money to get down to a salon to do our hair? I mean, the results really are lovely, but it is also difficult to maintain the visits. I suppose this is why people keep harping on taking care of my hair at home.. and so.. I took the first step! Introducing my L'Oreal Mythic Oil Nourishing Shampoo! This cost me about SGD $30 and will last about 1 month, which kind of made my heart cry because my usual shampoo is around $8 and lasts 3 months. In that case, I can only assume that this should make a world of difference for me right? RIGHT. But I'll go into that later, let's start with some background information. It's suitable for all hair types, though I do think that dry hair may stand to benefit from this the most. It works towards balancing the hair's natural oils by gently cleansing and reducing oil at the root so that hair is left feeling clean, soft, supple, and brilliantly shiny. 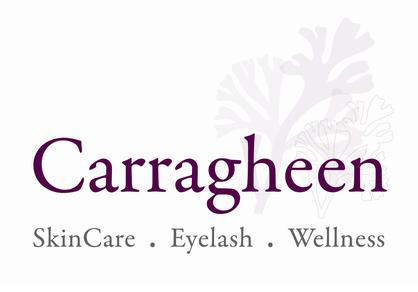 The formula is paraben-free! Which is good because parabens can contribute to cancer later on. Its ingredients include Argan Oil which is rich in Vitamin E and Omega 3 - this is easily absorbed into the hair to deeply nourish and provide control. 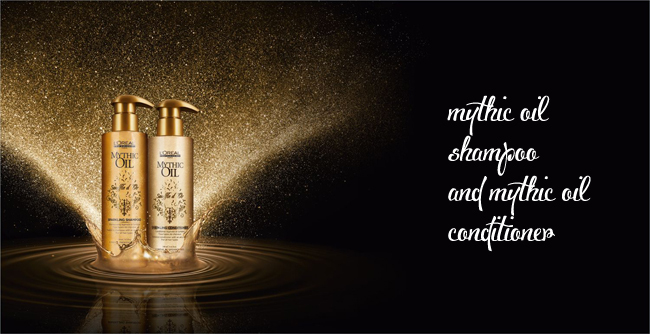 It also contains Cotton Seed Oil which is naturally light in weight and creates an extremely soft and weightless finish. The look of the product is very very sleek. I love it because it looks like liquid gold and does have that "mythical" sense about it since the lettering is also in a kind of shiny gold print. Even the pump is gold-colored! Haha. What I like is how the bottle is very compact and looks pretty in the bathroom. On top of that, it's extremely easy to use. Just pump the product into your hand and use it, ta-da! Just as described, this formula is very very light. It also smells of baby shampoo, which is so lovely. Somehow the smell of baby shampoo is just so calming isn't it? It just keeps assuring us we're doing good things to our hair (haha going into mental semantics right now). As you can see, when pumped out, the shampoo is rather colorless. I've been using SunSilk for awhile, so maybe those who use it can understand what I mean when I say that SunSilk feels so HEAVY. When you pump the shampoo out into your palm, you feel its weight. It feels sticky and tacky as well. But that is so far from the case with this one. Well it's a no brainer here if you use shampoo everyday. I think everyone has their own methods. Some people believe that only shampoo-ing every alternate day is best, some people believe that only washing the scalp is necessary and so on.. you get my drift. I definitely think it has made my hair softer, though I do want to try the conditioner out as well (heh heh itchy shopaholic fingers)! I especially love the smell because it's just so light. There is no strong chemical smell that most drugstore shampoos have; instead, it smells very subtle and pleasing all at the same time. It's difficult to explain, but this is really the best and simplest I can do! Texture-wise, yes my hair is healthier and smoother. There also seems to be a shine where I never had any! It just cleans my hair so well and makes it look so well taken-care of despite my most pathetic efforts of maintenance. I love the shape and movement of my hair now, and I am slowly getting the importance of having more good hair days! Cheers to that! Anyone with any hair really, especially those who find their hair very important to them. I think dry hair and damaged hair will see the best results though. Stockists: I purchased mine from Bugis Essensuals, but I do think you can purchase this at other leading hair salons in Singapore. Here's to better hair days! Interesting.... I must check this out! Yes this is actually rumored to be one of the better ones! :) definitely worth a try! I will have to try this out. I have like nine million different types of shampoo in my house and my hair is still not looking great.. I need something better. Oh no.. have you tried any treatments yet? Those are quicker at solving the problem for better hair :) I would say this is quite a good investment, I have not regretted my decision! 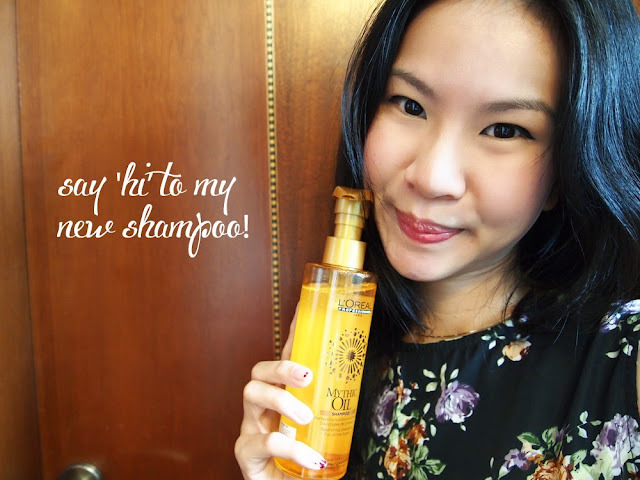 i use the mythic oil (range) hair mask! so instead of a regular conditioner i use the mask after i shampoo (with regular 8 dollar shampoo lol), and i feel the mask makes all the difference! i forgot to sign off! its abby ! Yeah! seems to be really effective. It works! Thanks for sharing this blog. Really like it. yes the result is pretty amazing! Hi m varsha .... I used dis shampoo ... Bt is dis for dos who ve hair fall and dry hair ...?? 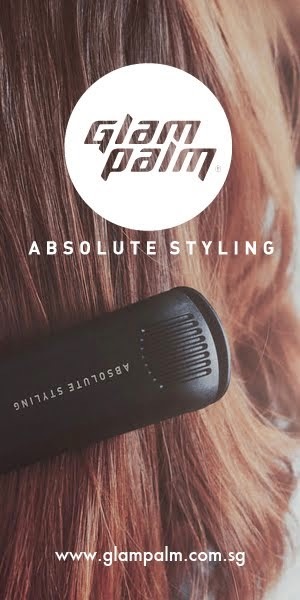 can we use this after hair smoothing? 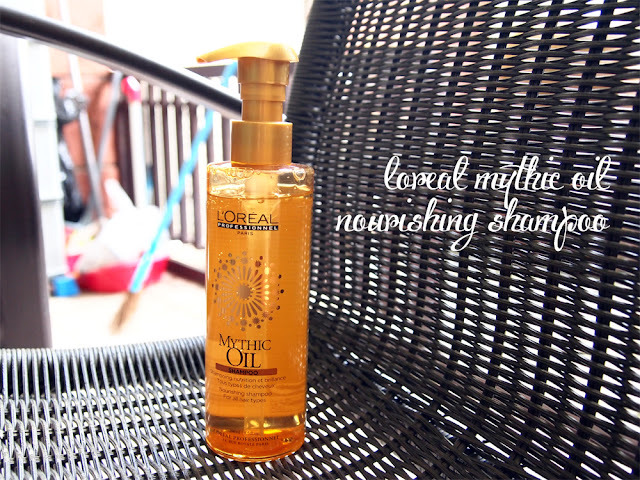 Thanks for this insightful review on L'Oreal mythic oil nourishing shampoo. However I personally feel that it is best for normal or dry, rough hair. It will make oily hair too much oily. do you think it will be helpful for chemically damaged hair i mean bleached hair.i need a repair and about to buy this shampoo and hair mask. please do reply.